The original album, no doubt, deserves a 10, but the same cannot be said for these reissues. 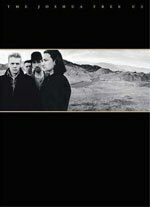 On the original CD cover of U2's The Joshua Tree, the band looms large in the frame, their images blurred against the background of the national park the album is named after. Twenty years later, this seminal work is being reissued, and the cover is slightly different (using the original vinyl LP cover instead of the more recognizable CD art). This time, the same photo, still capturing the band standing in front of the desert, communicates much more. Huddled to the left in the foreground are Larry Mullen, Jr., Adam Clayton, the Edge, and Bono, their images now in clear focus. Behind them is America, symbolized by the frightening immensity of its beautiful, indifferent landscape, now in full view. Though the band is still the focal point of the photo, they look small and vulnerable in front of the desert, almost as if its mere being is about to overwhelm them. Whether intentional or not, this image reveals the true essence and legacy of the album. Coming at the end of the band's first phase, their punk-in-ethos-but-not-in-sound/new-wave phase, The Joshua Tree saw U2 fascinated with America. Not just the musical genres of America (though those are all over the album), and not just with the mass of land wedged between the Pacific and Atlantic oceans, but also with America the Idea. Bono has always suffered from a Messiah complex, and it only made sense that his band would one day turn their attention to an entire nation with a similar fixation. Little did U2 know that they'd spend the rest of their career dealing with the enormous success of this musical detour through Americana. Much like the landscape depicted on the cover, the album itself would threaten to devour them. Musically, the album saw U2 shifting from their early sound and borrowing heavily from American genres, from the ragged harmonica blues of “Trip Through Your Wires” to the Dust Bowl gospel of “Running to Stand Still” to the enraged psychedelia of “Bullet the Blue Sky”. Even when the band did something musically innovative, the music still grappled with trying to evoke the Promised Land. The opening guitar sequence of “Where the Streets Have No Name”, for example, is as epic and panoramic as the wide open spaces of the southwestern desert. It wasn't just the music, though, that struggled with the concept of America. Thematically, the album deals with American preoccupations, such as the perennial search for God and trying to understand senseless violence. True, those are universal concerns, but Bono was clearly trying to tap into the American mythos, as the documentary Rattle and Hum would later make clear. Sun Studio? Black churches? Elvis? The evidence is pretty clear. U2 were trying to connect with something much larger than themselves, and boy did it work. During the two decades that have elapsed since then, every move the band has made has been, in some way, a reaction to the legacy of The Joshua Tree. Rattle and Hum was an extension of the album, further exploring American music forms such as blues, gospel, and soul. Then, inevitably, U2 got tired of living in their own shadow, and both Achtung Baby and Zooropa chipped away at expectations of the band. When they finally realized there was no escaping their iconic status sealed by The Joshua Tree, U2 mocked it on Pop. By then, though, fans had grown weary of the band's experimentation, and U2 have spent their last two albums trying to recapture the radio-friendly sound of their 1987 opus. So, by the way, has an entire generation of bands. The reach of The Joshua Tree's legacy is nearly impossible to assess, so it's little wonder that U2 is reissuing it. And, in typical U2 fashion, they're reissuing it on a grandiose scale in four different versions. First, there's simply the remastered version, featuring the same tracks with better sound. Second, there's the “Deluxe” edition, which is not only remastered, but also comes with an album of rarities. Then, there's the “Super Deluxe” edition, which bests the mere “Deluxe” edition by adding a DVD. Finally, there's the vinyl version that includes the original album and the additional material. Yes, it all sounds like a marketing ploy worthy of Microsoft. And a marketing ploy it just might be. Unfortunately, while the album is an undeniable classic and masterpiece, these reissues offer little for the average fan. With vinyl becoming increasingly popular, the vinyl version will make an obligatory addition to one's record collection. This is due to the format, however, not the additional content. When it comes to that, there's little of value here. With the exception of a couple of tracks like “Spanish Eyes” and “Silver and Gold” there’s not much to compel somebody who doesn't already own the album to go out and buy one of these reissue versions. As far as the DVD, the documentary is mildly intriguing, but not worthy of repeated viewings. The same holds true of the vintage concert. Who, after all, hasn't seen concert footage from this era? And if your reason for purchasing one of these reissues is the improved sound quality, it still possesses the muffled sheen of many recordings of the '80s, which was a low point for production values. So while the original album, no doubt, deserves a 10 rating, the same cannot be said for these reissues. Reissues must be judged by what else they offer, other than the original material in the original sound. As painful as it is to say, U2 has finally fallen victim to their own holiday marketing scheme (they've released a product every holiday season since before the turn of the millennium). Rather than giving their fans something of substance, they're now exploiting their own legacy. Yes, the album cover reveals quite a lot. Alas, U2, and what they have come to stand for, come into clear view.